From Green Bay take Highway 42/57 to Sturgeon Bay. 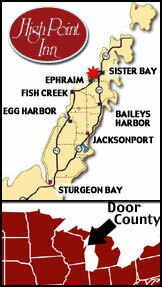 Outside of Sturgeon Bay, at the fork, take 42 North through Egg Harbor and Fish Creek. Once in Ephraim, go through to the North end of town. High Point Inn is then located off of Highway 42, on the right.